Our tour left reception at 7:30am and we patiently waited on the bright purple sofas. At 7:50am our guide arrived and made a bad first impression. We had agreed when we booked a price of ¥180CW each, about £23. A bargain really as it included transfer to The Great Wall, The Ming Tombs, visit to the Olympic park, lunch and all entrance fees!! She demanded an extra ¥100 each with no explanation so we refused. She also revealed that we had to visit 3 shops on the tour as well: a jade factory; a tea house; and a silk shop. We both clicked, this is where they make there money: commission from tourists visiting/buying at these shops. Guidzilla wasn’t happy when we told her we didn’t want to visit these places or the fact we weren’t going to buy anything! After around 10/15 minutes of arguing (and winning the argument) we got into the van and set off. We told her and figured, if she did a good job we would tip her at the end. However we did feel quite bad, as we didn’t realise there was an Eritrean man waiting in the van for the tour as well. Whoops. The journey to our first destination the Ming Tombs was around an hour and half. Guidzilla occasionally looked up from playing candy crush and said something about a building we were passing to quickly for any of us to understand. Her tip was already looking dubious. We stopped but not at the Tombs but the jade factory. While interesting to see the process of how they carve jade, and that it can come in other colours other than green: it was a vast shop of over priced jade trinkets. Jade not even being that popular in the UK we passed and went back to the bus. In fact the guide didn’t show up for another 15 minutes as she was having her free coffee inside. Back on the road we arrived at the Ming Tombs. 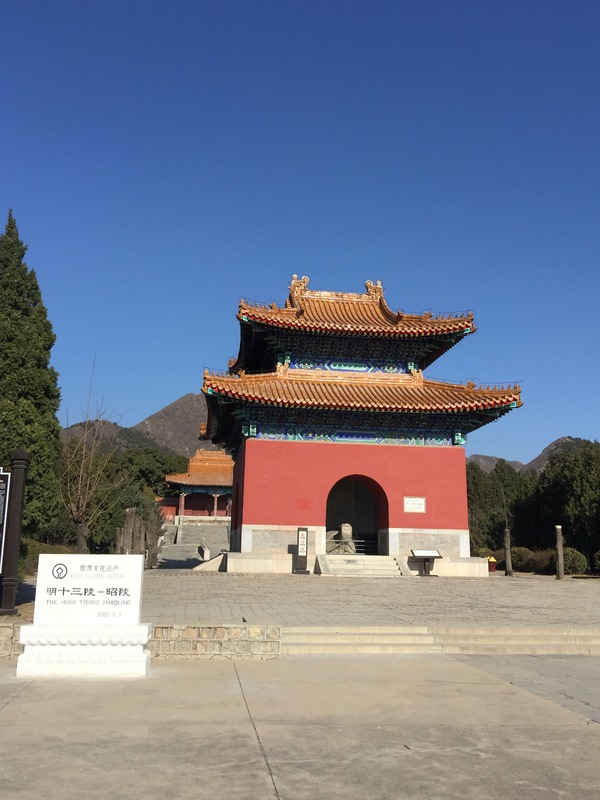 There are thirteen tombs all together, housing 13 emperors as well as many wives and concubines, built between 1409 and 1644 when the Ming dynasty collapsed. The buildings were impressive but essentially the same as the Forbidden City. So not really worth the visit, which is why it was empty. 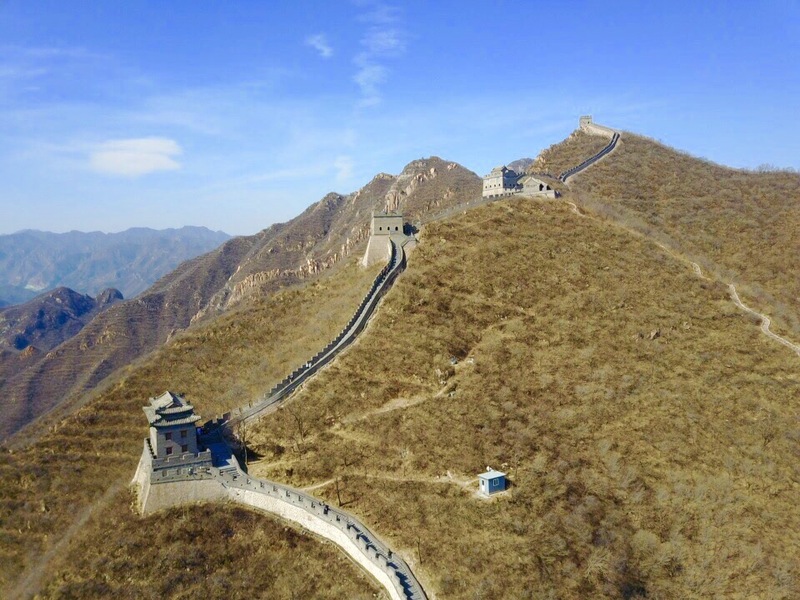 We carried on to the Great Wall. 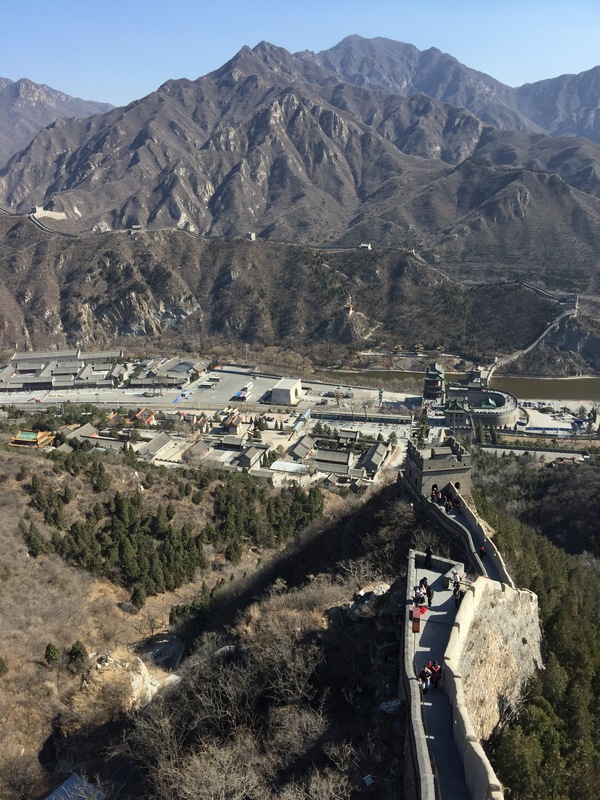 We had decided to visit the Badaling section as we would be visiting the Mutiyanu section with our group. We turned up at a 3rd section however- the Juyongguan section. We decided not to mention it but start the climb instead. This section we had read was the steepest and has no cable car or chair lift. So climbing was the only way up. What started off as a slight gradient became very steep huge steps. Uneven in height. Some section felt practically vertical! Undeterred we climbed past crowds, passing guard towers and one particularly badly repaired section. The wall itself was wide enough for 6 people abreast at points and only two at some lunch points. Built in a grey brick it weaves its way through the mountains into the distance. Both sides were covered in foliage which in spring, summer and autumn must be stunning but most where bare due to us visiting in winter. In fact it was bitterly cold and we were glad we had worn 4 layers!! Mike stopped half way up and I carried on to the next tower where the wall went out of view. Once I got there I could see even more steep sections snaking their way up the mountain and decided to pass. Opting instead for some scenic photos. I climbed back down and joined Mike where we flew the drone over head for some aerial shots. While the drone took off and flew well, 20 minutes later when it came to landing the wind and small crowd had gathered. The wind swirled and nearly sent the new drone into the ancient monument. Luckily, Mike now being a pro flier managed to land it intact. Phew! We descended the wall slowly taking more pictures and enjoying the view. At the bottom we found a nice spot to get the whole section in shot and departed for our bus. We stopped for lunch which was some sweet and sour chicken and Chinese cabbage. Quite tasty given that it was included in the tour. Next we headed back to Beijing and to the Olympic park. Unfortunately, we flew through the Olympic park and didn’t even stop to get a decent shot of the famous Birds Nest Stadium from the 2008 Olympics. We did have time to stop at the tea house however. We were guided through and tried different varieties of Chinese tea: Oolong, Jasmine, Oriental Beauty, Fruit, Litchi and Wild Pu’er. All pleasant apart from the last one Wild Pu’er. This one is aged and the older the better (apparently). It tasted like over done boiled rice though the Chinese drink it because it is slimming and hopefully not for taste. It is also 20 times the price of regular tea. Under pressure we bought some of our favourite Oolong and departed. Next we were dragged to a silk workshop. While interesting, having been to a silk factory when we visited Cambodia we both were a little bored. On offer was silk bedding and duvets, nothing we wanted so we made a quick escape. Our driver and guide were no were to be seen so we hop footed it down the road. Guidzilla’s missed out on her tip, playing candy crush, extremely limited information meant she didn’t earn it in the end. On the plus side, the silk workshop was near the Temple of Heaven (which was also in our list of things to see) so we took the short walk there. 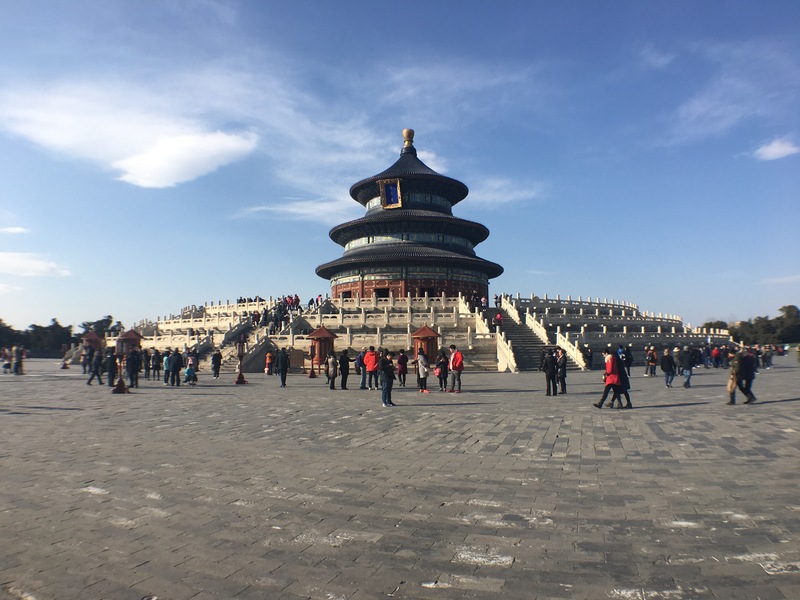 The temple is impressive as instead of being rectangular with a yellow or green roof, it is circular on a high platform with a bright blue roof. Built for an emperors wife it made for some nice photos at the end of the day, even if the entry fees were a little steep. To return to the hotel we took our first trip on the Beijing metro or subway. Extremely efficient and ran very similarly to the Singapore system. The signage and machines all worked in English so was easy to follow and navigate. Security however was extra tight as they body scanned everyone and X-rayed all bags and luggage. We arrived back at the hotel ready to meet our travel group for China and tour guide (or CEO chief experience officer as they like to be called). Our China trip would be a YOLO (you only live once) so we expected to be the oldest as it is a strict 18-39 policy. So we prepared for enthusiastic 20 somethings with buddies of energy. The group were great and gelled straight away, as we went for dinner and stuffed ourselves with Peking duck. Then we headed to the night market and some of the group to part in eating snake, spider and scorpion we haggled with local traders over the price of some bronze knock off dragons. Overall it was an extremely busy day and the Great Wall was a huge highlight. 2 days left in Beijing to go.